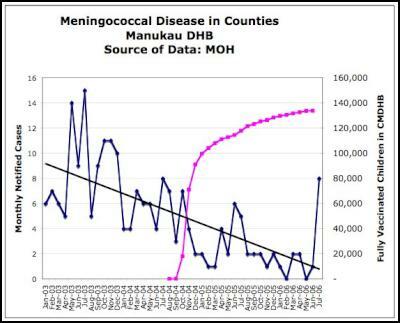 How tragic that the Ministry of Health brags about the "calculated" lives being saved at the same time a Tangi is taking place in the Waikato for a fully vaccinated 2 year old boy who died of meningococcal disease in Starship Hospital during the weekend. 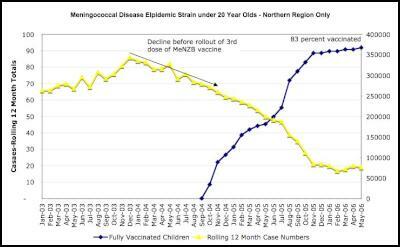 This is the second fully vaccinated that child we know about to have died of meningococcal disease and highlights the myth that the MeNZB vaccine protects children from anything, let alone meningococcal disease. We do know what train this child died from, but that is irrelevant; the Ministry of Health used all cases and all deaths to justify a $220 million medical experiment knowing that it had mislead the public and the media. 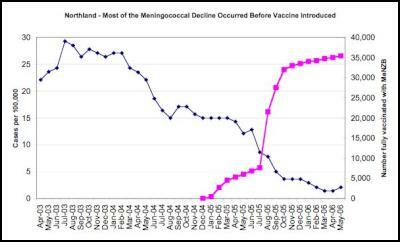 Even if the Ministry of Health's claims of 80 percent effectiveness are true (and that is not the case) at best there would be a 34 percent reduction in all meningococcal disease cases. 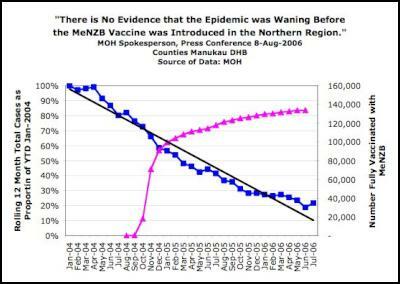 Despite this, the Ministry of Health held a press conference today proclaiming that the MeNZB vaccine was a great success. At today's press conference Dr Jane O'Hallahan stated that there was no evidence that the meningococcal disease epidemic was waning naturally in the Northern Region before the MeNZB vaccine was rolled out. This statement defies belief and flies in the face of the Ministry's own data. [See Graphs 1, 2, 3, 4 & 5]. One wonders why the Ministry of Health continues to proclaim such false statements while fully vaccinated children continue to suffer. We repeat our call for a full Royal Commission of Inquiry into how a nation can be so totally swayed by officials and advisors into spending a quarter of a billion dollars for such a gamble that has delivered false hope to trusting New Zealanders.